Wm. Jeff Kahrs was appointed Regional Director of Region 7 of the U.S. Department of Health and Human Services in November 2017. As a presidential appointee, Kahrs provides executive leadership as the primary representative for the Secretary of Health and Human Services. In this role, Kahrs oversees HHS activities in Iowa, Kansas, Missouri, and Nebraska, and represents the department in its work with nine federally recognized tribes. The Office of the Regional Director, based in Kansas City, Mo., also has responsibility for intergovernmental and external affairs, which brings together federal, state, local and tribal governments and private-sector partners. Mr. Kahrs brings to HHS 25 years' experience in public service. 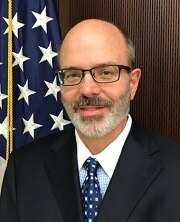 Most recently, he served as the deputy secretary and chief of staff for the Kansas Department for Children and Families. In six years with that agency, he led the effort to transform the state's outdated social services agency into an agency of opportunity that promotes healthy families and encourages personal responsibility. Before joining Kansas state government, Kahrs spent 16 years as a congressional staff member. He began his congressional tenure in 1995 as legislative director for U.S. Rep. Todd Tiahrt of Kansas. He became Tiahrt's chief of staff in 2000 and held that position until 2011. As chief of staff, Kahrs developed extensive knowledge of the House appropriations process and the HHS budget. Prior to his service on Capitol Hill, he spent two years as law clerk for the chief justice of the Kansas Supreme Court. Kahrs is a fourth-generation Kansan who grew up in Wichita. He received his bachelor of business administration degree in business management from Wichita State University. He later earned his law degree with honors from Washburn University Law School, where he served as research editor on the Washburn Law Review. Jeff and his wife, Felita, currently reside in Topeka, Kan., with their sons, Samuel and William.